Children's seating products are basically the same as adult seating products only, of course, smaller. Although the products are similar, seating products for children are usually more important, more extensively used and growable. Children have seating needs which don't apply to adults. The first issue that kids wheelchair seating must deal with is growth and adjustability. If the seating chosen for the child will not grow larger easily, then the parents end up buying new seating long before it would normally be needed. Kids wheelchair seating systems must have some adjustability for growth. The second issue when choosing wheelchair seating for kids is whether to buy/prescribe a system which will accommodate the child's shape or correct it. Some kids will have fixed deformities which have to be accommodated they can not be changed. Other kids will get seating systems which will correct their posture. Kids whose posture can be corrected with the seating system will often benefit from greater comfort and a prevention of further complications caused by poor posture. Pressure relief is important for both children and adults however the causes for pressure sores in children are usually different then adults. For adults, weight and inability to weight shift are major factors but with kids, especially young ones, the contributing factors are more commonly heat and moisture due to diapers and incontinence. While most adults and some children can get away with just purchasing a back support and a cushion for their wheelchair, many kids need a full system to attain the growth and support needed. A seating system will contain a cushion and back support but may also have one or more other seating products and the whole system is designed to work together to meet all the seating needs of the child. The first item considered for a seating system is the cushion. There are a variety of products to meet different needs of the kids. Some will primarily be designed for pressure relief and others for proper positioning. They can utilise a couple of types of gel, air, a variety of foams or a combination of gel, air and foam to achieve the properties they are designed for. Bases are used in place of cushions and differ in that the base will have a solid seat pan incorporated to mount other seating accessories and allow for angling the seat if needed. Back supports are primarily positioning products. They are used to keep the child seated as upright as possible and preventing leaning forwards, backwards or to the sides. 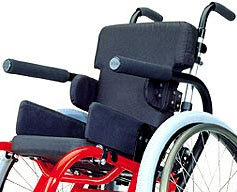 They can often be mounted on the wheelchair at a forward or rear ward angle if needed for optimal positioning. The also can serve as a mounting surface for several other seating accessories that may be required. Lateral supports are primarily for preventing the child from leaning to the side however some curved designs can also be of some help in preventing forward leaning. They will be either mounted to the back support of built into it and can vary in height and length. Some designs of lateral supports will swing away to ease putting the child in the wheelchair and dressing in coats, jackets etc. Abductors are also known as pommels and are positioned between the knees to prevent, if needed, the child's knees from pushing together. The abductor sometimes also prevent wind sweeping of the knees. Wind sweeping is when both knees will both naturally move together to a right or left position when the child's hips are positioned straight. Abductors can usually be flipped out of the way or removed for transfers and are usually mounted to a base. Adductors are pads mounted outside the knees that prevent the knees from splaying apart and can also help to prevent wind sweeping when used with an abductor. They are mounted to the base. Hip guides are mounted to the base and prevent the hips from shifting from side to side on the base. They can be used in pairs or singly and come in different sizes. Head rests are mounted to the back support and come in a variety of sizes and styles to help keep the head positioned in the most optimal position. There is usually some adjustability in the mounting hardware to get the head rest positioned were needed. Head rests should always be used when the child is being transported in a vehicle, in their wheelchair. Chest straps are simply straps which mount across the chest to prevent falling forward. They can simply mount across the back from side to side or be shaped like back pack straps which also help keep the shoulders back. A lap belt fits across the hips to keep them down and back into position. They can be padded and have side release, auto style or airline style buckles. They are available in different widths and lengths. When transported in a wheelchair, in a vehicle the lap belt is not a substitute for a seat belt mounted to the vehicle. Used for the same purpose as the lap belt above the four point belt is used when a downward pressure is needed in addition to a rear ward pressure to keep the hips in place. There are two straps on each side of the seat with one pulling down and the other pulling back. A sub ASIS (Anterior Superior Iliac Spine) bars are padded bars which are normally mounted to the wheelchair frame and are fitted across the thighs where they meet the hips. They are a rather extreme method of keeping the hips in place when a lap belt won't do the job of keeping the hips back and down on the cushion or base.